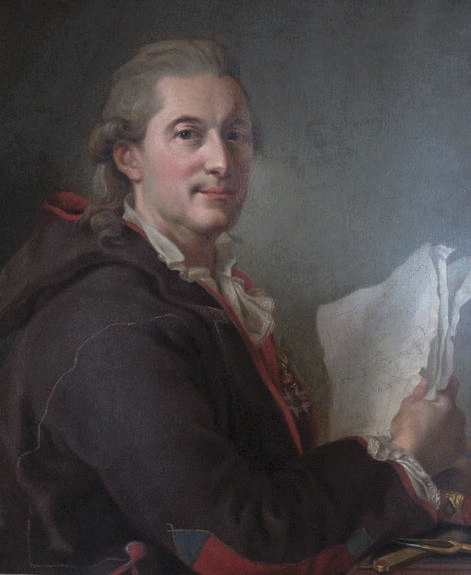 Frederick Henrik af Chapman (1721-1808), painted by Lorens Pasch the Younger in 1778. Chapman is wearing his hooded work jacket with the Order of Vasa pinned to it. Frederick Henrik af Chapman (1721-1808) was the foremost naval architect of his time and responsible for the construction of many of the Swedish East India Company's ships. He was born in Gothenburg, the son of an English shipbuilder, he spent his life in Swedish shipyards. In Gothenburg 1744-50, Karlskrona 1757-60 and 1780 onwards, as well as spells at Stralsund and Suomenlinna. In 1765 he was commissioned by the Kings brother, the Admiral of the Fleet, to compile his momumental work on shipsbuilding, the Architectura Navalis Mercatoria, gathering together designs for the best ships from all round Europe. In his later life he became head of the Karlskrona shipyard. Skärfva Manor has a personal touch of its original owner Fredric Henric af Chapman and reflects in many ways the time and taste at the end of the 18th century. The shipbuilder Chapman often had guests at Skärfva, both in private matters and in business. The study was sometimes too small and therefore they used the Chinese cabinet, at the end of one wing. From the windows there was a view of the park and in the background Karlskrona with its bustling activity, but attention should however have been directed to the cabinet’s content. The cabinet became a place where people gathered and admired an encounter with a distant world through the 96 gouaches depicting Chinese vessels (lot 140-235). The gouaches on paper in glass and gilded frames hung in three rows and thus covered the walls of the room. The ladderback-chairs placed under the gouaches along the walls shows the social function of the room. In the room there were also console tables (one of which is in the auction, lot 259), where busts of King Gustav III and Ehrensvärd (catalogue number 240 & 241) according to an inventory were placed. A chandelier hanging from the ceiling gave the room light (lot 252), and curtains and blinds protected the rare gouaches from the light coming in through the windows. The Chinese gouaches are excellent examples of a type of chinoiseries which became popular both in Europe and in Sweden during the 18th century. Chinese cabinets were created around the country in the royal castles and manor houses. Redecorating with Chinese wallpaper made of paper and silk was popular, food was served on Chinese porcelain and people were drinking tea. This was embodied e.g. by the Kina slott at Drottningholm, Stockholm by Adelcrantz and Rehn in 1769 which Chapman had seen during his Stockholm period. He created this room at Skärfva primarily from his professional role as a shipbuilder, but also from an artistic point of view. He combined his professional interest with his sense for art. Fredric Henric af Chapman’s elder brother Charles was a captain in the Swedish East India Company, and perhaps it was he who ordered and brought the gouaches to his brother. Charles Chapman made a number of trips between Gothenburg and Canton, the last as captain of The Terra Nova in 1775-76, and perhaps it was during this journey he brought the gouaches back to Sweden. Charles Chapman died in December 1776, and we can because of this limit the period of their dating to before 1776. It is likely that the paintings were commissioned by the Swedish East India Company and executed in a local studio in Canton. The so-called trade paintings (Chinese trade art) were made for the European merchants during the second half of the 18th Century. Local anonymous artists depicting life in Canton painted motives with vessels and commercial subjects. The paintings are works of art in themselves, with a personal touch. The Chinese artists had for a long period created souvenirs of the Chinese trade through various types of media. Trade and exchange with Europe led to influences and impressions from European art. This affected both the practice and aesthetics of different art forms and led to a creative symbiosis. The same pattern can be seen in painting on porcelain as in the traditional painting on paper or silk. The flat, slightly abstract impression of traditional Chinese painting was combined with fixed-point perspective and other western conventions such as shading. The detailed 96 gouaches in this auction depict various vessels found in Canton in the 18th century. They all have an inscription in latin letters with the vessels appellation in Cantonese and an explanation in Swedish. These texts have most likely been written by a Swede, who must have had knowledge in the use of the vessels, possibly by having been in Canton. They describe the function of the vessels and / or destination. Possibly it was Charles Chapman who wrote these descriptions. The reason for this thought is that there is one vessel designated "Chinesisk hor Champan". Usually this type of small boat was spelled schampan, but could it be that the brother wanted to tease a little and spelled it with a capital C to imitate their common last name Chapman? Fredric Henric af Chapman fathered children out of the marriage and this could therefore be seen as a pun from the older brother. Another theory is that it was the Karlskrona shipyard painter Carl Wilhelm Svedberg who wrote the text on the gouaches, possibly with the help of Chapman. Thanks to the texts the vessels can be arranged in their various functions. On one hand, there are official vessels such as war vessels, guard schampans and others, on the other merchant vessels that transported and sold fruit, groceries, fishing gear, spices, wood, porcelain, tea, brandy, charcoal, bricks and flowers. Others were for passengers, pleasure, fishing etc. The various vessels was called schampans, junks etc. Given their diversity and that they were displayed without any specific order in the Chinese cabinet, we can assume that it was just as the Pearl River delta in Canton was experienced with all the different vessels. Fredric Henric af Chapman seems not to have used them in a professional context, at least not to any great extent, but they rather had the role of a window into another world. The careful, detailed pictures of the vessels, goods and people contrast with the calm water. Traditionally, the water was portrayed in this way and provides a quiet and peaceful impression, but that was hardly the case in the Cantonese waters. Merchants selling their goods, others greeting each other and new arrivals being welcomed. You could hear the gongs, music and cannon salute from the big ships. This document of an ancient era and a different world gives us today valuable information from a maritime historical point of view; we can study what the vessels looked like, how they were constructed, as well as details such as masts, sails, oars, anchors, etc. We can also understand what the Chinese trade looked like and what goods they dealt with. But above all, they are, each independently, expressive works of art with a history. As a whole, it is an exceptional and unique collection. Copyright © Jan-Erik Nilsson, Göteborg, 2014.